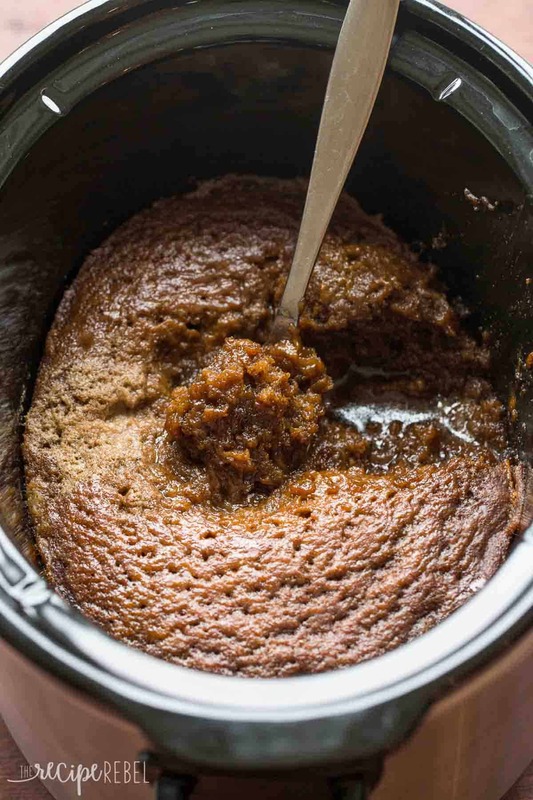 Gingerbread Pudding Cake: a Slow Cooker Dessert! Can you guys believe this is only my second time making dessert in the slow cooker? Thankfully, since then no one has gotten quite as close to my slow cooker lid again. I’d love to take all the credit for this wonder, but I’ve actually adapted the recipe from a Taste of Home Slow Cooker cookbook. I love a good spice cake or gingersnap in the winter, but I firmly believe everything is better in pudding cake form so I had to give it a go. I made it healthier by reducing the butter and using all whole wheat flour. There are times I like to use whole wheat flour, and there are times when I don’t like to use whole wheat flour. Whole wheat flour can sometimes make things drier or tougher, or add some unwanted texture (I’m not really selling you, am I?). But in a pudding cake? You know it’s not going to be dry or tough so go all out and use 100% whole wheat flour. Things like chocolate brownies or cakes, because the texture and flavor is masked in the chocolate, are easy to do whole wheat. I will often do vanilla desserts and yeast breads or rolls whole wheat if they’re staying at home, and use all purpose flour if I’m bringing them somewhere, because I know some people are used to the texture of whole wheat flour. That being said, you will absolutely never notice it in a pudding cake. I was a little nervous about this cake not working. I mean, you pour the batter in, and it looks a little gross. And it doesn’t seem like you add enough brown sugar to justify adding all that extra liquid on top, but it just works! I cooked mine on high for about 2.5-3 hours, and I would say it was just perfect. If you need it to last a little longer, I’m sure you could cook for 2.5 hours on high and then set to low. See how easy it is to make and don’t forget to subscribe on YouTube! With an electric mixer, beat butter and sugar until combined. Add egg and beat until combined. Add vanilla, molasses and water and beat (start on low!) until combined. There might be a few flecks of butter unincorporated, but that's okay. Add the flour, baking soda, cinnamon, ginger, salt and nutmeg and beat until combined. Pour into greased 3-4 quart slow cooker. Sprinkle batter with brown sugar. Combine hot water and melted butter and pour over brown sugar (no stirring!). Cover with the lid and cook on high for 2.5-3 hours. Serve warm with ice cream or whipped cream. With an electric mixer, beat butter and sugar until combined. Add egg and beat until combined. Add vanilla, molasses and water and beat (start on low!) until combined. There might be a few flecks of butter unincorporated, but that’s okay. I just made this… very yummy! I turned it off around the 2-2.5hr mark but left the lid on. It ended up being a little overdone, so next time I won’t do that. I will mention that I added a little finely chopped fresh ginger and some chopped candied ginger to it for extra ginger flavour. I didn’t notice the fresh ginger but the bits of candied ginger gave it an extra yummy punch. Very glad I added that. Thanks for sharing your recipe. Hi. Would I be able to add raisins or sultanas to the gingerbread pudding? I haven’t ever tried but I think it should work okay! I’d love to hear how it goes! I made this as my dessert on Christmas Day and it was wonderful!! Nothing but rave reviews from my guests! I have never made Christmas pudding before, let alone in a slow cooker, but it surpassed my expectations and turned out perfectly! I doubled the recipe as I thought it wouldn’t make enough for 8 people but I was certainly wrong.. the single recipe would have been enough! But doubling did leave me with a lot of delicious leftovers which heated-up in the microwave nicely! I did cook it for exactly 2.5 hours on low which was perfect. Served it alongside vanilla ice cream – delish! This may be a new Christmas dessert tradition for me!! Meant to say 2.5 hours on high.. (not low)! So, you didn’t need to increase the cooking time if you were doubling the recipe? I am only nervous that the egg will cook so it will be safe! This is a favrouite of ours to eat outside on Halloween, but we have to feed a bigger crowd this year! Slow cooker desserts are my favorite — so easy for feeding a crowd! I’m so happy to hear you liked it! I made this for our dessert on New Years Eve and it was delicious. After reading a few of the comments, I was generous with the cinnamon and ginger. I might try doubling it next time as I do like a strong spicy taste. I was a bit concerned that the mixture was too watery when I poured it into the slow cooker, and there were definite lumps of butter visible, but it turned out perfectly. I cooked it on high for 2 hours and then turned it to low for 45 mins. I will definitely make it again! 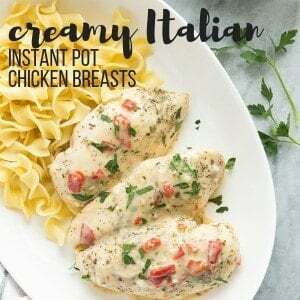 It was easy and quick, tasty and fabulous. Low effort, high taste, thank you so much for the recipe! I did wonder what would happen if you dropped dark chocolate chunks in about half an hour before eating it?! I made this last night and it was delicious! I cooked it for 3 hrs which might have been a little long as it was a little dry on the edges. Next time I’ll cook it for 2.5 hours. And I might punch up the spice a bit but overall a great recipe! Would Black Strap molasses work in this recipe or is it too strong of a flavor for this? Sorry — I’ve actually never used it before so I’m not sure how much stronger it is! You could always try reducing the molasses slightly if you think it’d be a problem. I was so looking forward to cooking and eating this. One of the problems I saw was that almost all of the reviews/comments were people saying they couldn’t wait to make it – none from people who actually made it and said they liked it. Second, the recipe was more preparing it before putting it in the crock pot. And sadly, after trying it, the consistency or something just didn’t taste good. We didn’t even finish it. 🙁 I do like your site, and have signed up for the emails – I just hope more people who actually cooked the recipe will respond. Hi Pebble — I agree. It’d be great if more people left comments! I would hardly call this a problem though, and if it is, it certainly isn’t mine. I would love for more people to leave actual reviews once they actually make a recipe, but there’s nothing I can really do about it. I’m sorry you weren’t a fan of the pudding cake! 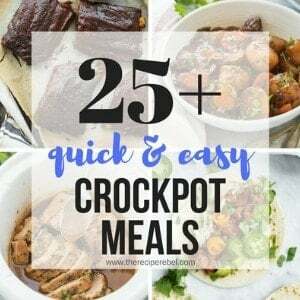 The only actual prep work is before putting it in the slow cooker, as it does all of the work, so I’m not sure what else you are looking for. It is a very moist cake (a cross between a pudding and a cake), and unlike a traditional cake so I’m not sure if that’s what you didn’t like or what, but I hope you try more recipes and let me know how you like them! Oh I will certainly try more recipes…….I hope I wasn’t too critical,but wanted to post my view of this recipe. 🙂 I’m one who usually reads the reviews before making a recipe. I’m hoping too that more people will post their results! Great! I’m happy to hear from you! This reminds me of a shoo fly pie without the pie crust. Just how spiced is this cake? I really like a stronger spiced flavor in gingerbread, especially if pairing with vanilla ice cream or whipped cream. Hi Denise! It’s hard for me to say how this compares to other gingerbreads you’ve had — my best advice would be to give it a try and see if you need to add more for next time! If you’re sure you want to add more, maybe a touch here and there of the spices and go from there. Do you think this would work in the casserole slow cooker? Question: Have you ever tried making a larger batch. 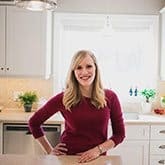 I really want to use this recipe to feed 20 people, so I would want to multiply the recipe by ~3. Any tips on this? I am just worried about the middle being baked enough. Thanks Connor! I haven’t ever made a larger batch. 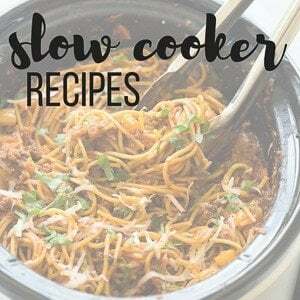 What size is your slow cooker? I think the biggest slow cooker you have would be best. And it would likely need to cook longer, though I’m not exactly sure by how much. Sorry I’m not much help! I hope it works out for you! I made this once and it was awesome. Now I want to make a larger cake so that I can take it to a party. Did you double the recipe? How long did it take to cook? YESSSSSSSSS. Ohmigod this is happening in my house. Thank you for the video! Loved it. Totally proved how easy it is – sometimes I need someone to show me, literally, how easy something is to put together. Can’t wait to try this! Haha, thanks Michelle! I can’t resist a warm gooey dessert in the winter! I am hoping this will be similar to the suet steamed pudding my grandma used to make for Christmas. Since Edible suet is impossible to find, I was going to try dates instead. But I will try this too and see if we can bring back a family tradition. 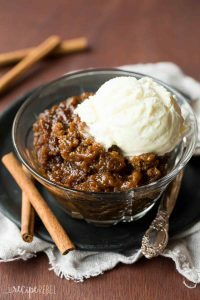 Desserts in the slow cooker are so good! And I always use 100% whole wheat flour in my gingerbread, I think it gives everything an even deeper and richer taste – plus nobody is ever going to notice anyway 😉 This pudding cake looks so good, Ashley! And I love your healthy twists! I bet your house smelled amazing when this was cooking! looks and sounds fantastic! It absolutely did! Thanks Manali! I love this! I’ve never tried making dessert in a slow cooker before. 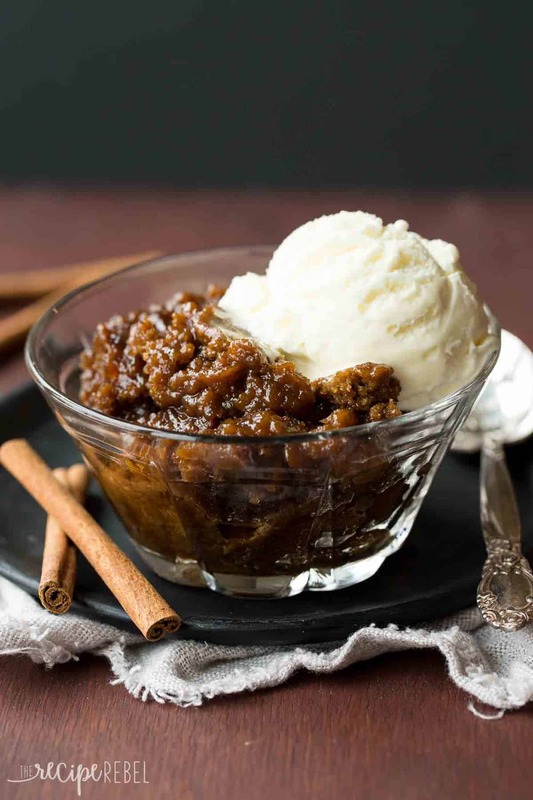 I love gingerbread flavor, and I love the idea of a warm pudding cake with ice cream. MMMMMM, now my stomach is grumbling. Oh warm desserts are soooo good when it’s cold out! The best with some melty ice cream 🙂 Thanks Meghan! I’m obsessed with gingerbread this time of year! Thanks June! Pudding cake is just one of my favorite desserts, especially in the winter! I have never made dessert in the slow cooker before this recipe looks magical! I’ve only made a few desserts in the slow cooker. I really need to change that! This pudding cake looks amazing! I have NEVER made a pudding cake – and it looks like I’m totally missing out! This cake looks sooo gooey and delicious, and I love that you don’t notice the whole wheat flour! I loooove making dessert in the crockpot! And I’ve gotta say, that this pudding cake seriously just looks like pure magic. I can hardly stand how moist and gooey it looks! I’ve only made a dessert one other time in the slow cooker, and I have to say, I love it! Though I definitely need to use it more often for the sweet treats. This pudding cake sounds amazing! I would love to devour this with a big scoop of ice cream!